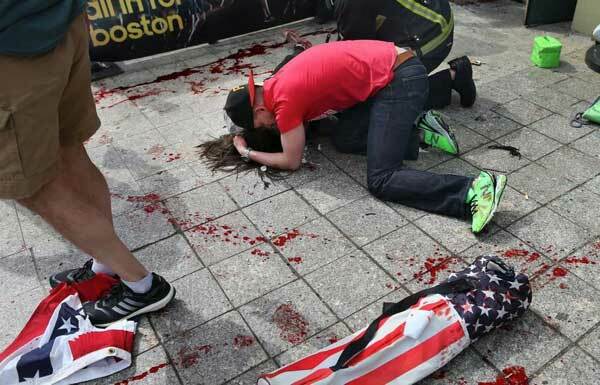 In an April 17 post, we called out Guardian contributor Glenn Greenwald on his rank hypocrisy in condemning the ‘rush to judgment’ in the aftermath of the April 15 Boston Marathon terrorist attack that killed 3 and injured over 180. In Greenwald’s CiF commentary, ‘The Boston bombing produces familiar and revealing reactions’, April 16, he ‘named and shamed’ those whose eagerness “to conclude that the attackers were Muslim was palpable and unseemly, even without any real evidence”, which, we noted, was remarkably audacious in light of his own rush to judgement in the aftermath of the attack on the US consulate in Libya last September. Greenwald, we noted, immediately (a day after the Sept. 11, 2012 assault) parroted false reports that the attack which left Ambassador Chris Stevens and three other Americans dead was caused by a film produced by an “Israeli Jew” and funded by “100 Jewish donors” – charges Greenwald was later forced to revise when it was demonstrated that the filmmaker was an Egyptian Christian, and that the film had no role whatsoever in the pre-meditated Islamist terror attack. However, in addition to the hypocrisy of Greenwald’s sanctimony over the ‘rush to judgement’ in the Boston terror attacks, we recently observed another one of the Guardian commentator’s signature habits of using hyperlinks which don’t in fact support the allegation being made. The rush, one might say the eagerness, to conclude that the attackers were Muslim was palpable and unseemly, even without any real evidence. The New York Post quickly claimed that the prime suspect was a Saudi national (while also inaccurately reporting that 12 people had been confirmed dead). The Post’s insinuation of responsibility was also suggested on CNN by Former Bush Homeland Security Adviser Fran Townsend (“We know that there is one Saudi national who was wounded in the leg who is being spoken to”). Former Democratic Rep. Jane Harman went on CNN to grossly speculate that Muslim groups were behind the attack. So, did former Democratic Rep. Jane Harman “grossly speculate” that “Muslim groups” were behind the attack? Former congresswoman Jane Harman, currently the President of the Woodrow Wilson International Center for Scholars told CNN News on April 15 that there is a very real possibility that the Boston Marathon bombings could be Al-Qaeda related. The bombs used in the attack are very similar to bombs used by Al-Qaeda in terrorist attacks across the world. So, clearly, the first link demonstrates that Harman, former Chair of the US House Intelligence Committee, didn’t blame “Muslim groups”, but merely speculated on the possibility that one fanatical Islamist group which very few Muslims actually support may be responsible. Further, the second link Greenwald used goes to a Twitter page with a series of Tweets in which others commented on Harman’s interview on CNN. A lot the victims, if it turns out to be anything related to Al Qaeda, a lot of the victims of these attacks are Muslims. Further, while information is still coming in about the two suspects – Tamerlan Tsarnaev, who died after a shootout with police , and his brother Dzhokhar Tsarnaev who was taken into police custody on Friday – it does seem clear that they are both indeed radical Chechen Muslims who were inspired by Islamist propaganda which promoted jihadist attacks on innocent civilians. Jane Harman’s suspicion that the Boston terror attack may have been perpetrated by followers of radical Islam appears to have been accurate. Contrary to Greenwald’s claims, Jane Harman did not blame “Muslim groups” for the incident in Boston, but in fact cautioned that, if the attacks were inspired by al-Qaeda or groups sympathetic to its ideology, it was important to understand that innocent Muslims are often the victims of deadly terrorist attacks by such Islamist terror movements. Finally, Greenwald has a history of using meaningless hyperbole and hyperlinks which don’t support his wild allegations, and his latest baseless smear of the former congresswoman should come as no surprise to those who already understand the dishonest lengths Greenwald often goes to buttress his pre-established extreme left narratives. The best thing about this is that Adam is having an impact, as evidenced by recent commentators who have posted on his blog. That will never mean much to hard-core leftists. They simply can’t wrap their limited minds around anything outside of the equation, Israel = bad. However, people who wouldn’t know otherwise are beginning to see through distortions of rags like The Guardian. Thanks Michael. I agree that some are unreachable, and I hope you’re right about the ‘fair minded’ lot. Those are the ones we are always trying to reach. He pre-emptively attacks “those whose eagerness to conclude that the attackers were Muslim was palpable and unseemly” when it was only he and his colleagues who were so spooked and flashed to this offensive and irrelevant conclusion..
Others rightly speculated that this could be the work of Islamist inspired terrorists. For those who have the jobs of getting to the bottom of these horrible crimes, like all the others, and of preventing further attacks, and those with the jobs of reporting all this, it would be irrational not to. Worse than that. Dereliction of duty to the point of criminality. Now the writers of the Guardian and progressives everywhere will keep up this work. Nothing will sway them from that. No words, no acts of man no matter how vile. Anything at all to avoid confronting the issue of this hateful ideology even if it means demeaning Muslims by holding them to the moral standards of this cold blooded barbarism. If the word “Islamophobia” has any meaning at all then surely we are looking at the very definition of it in the Guardian. It is at the core. . The two situations are not analogous at all. 1. The AP and WSJ initially confirmed the Sam Bacile lies. Yes, that well-known leftist/anti-Semetic publication the Wall Street Journal. When it turned out they got it wrong his article was updated. 2. She did in fact grossly speculate that Muslims were responsible despite having no credible information to suggest this was the case. Near simultaneous attacks are not only used by AQ but have been used by the US, Israel, the UK, IRA et al., separatist groups, lone wolf operators. That is to say, everyone intent on killing people. Inappropriate comparisons. During a war there are often multiple fronts, that is war, much different from a terrorist attack which is done by surprise and targets civilians. BTW, the Boston Marathon is different from organizations like Hamas who hide behind civilians for the purpose of human shields, despite libero-fascist attempts to draw equivalence. Michael- The other point is that certain types of bombs used are characteristic of certain groups. Some of the early reports I heard had intel types pointing to the evidence collected at the scene as being characteristic of AQ actions. That’s not to say that non-Muslim terrorists can’t use the same devices, but all the evidence pointed strongly to radical Muslims. Michael, Hamas and Hizbollah both do the same thing by firing and hiding behind civilians. But where your wrong is, why they do this. They do this because Islam calls for the sacrifice of children. Remember Islam follows Mohammad who married a 9 year old children. So ofcourse Arabs use civilians as human fodder. Thats Islam for you. Iran did the same thing in the Iran Iraq war. Iran would send children to the border with Iraq to pick up land mines planted by Iraq. Some of the times there were land mines and the children lost limbs after they picked up the land mines and they exploded. Dershowitz wrote a great article about this. Hezbollah’s positioning of weapons in the heart of civilian areas in around 100 Lebanese towns and villages along the border. “In the villages there are three-story houses: on one floor there are rockets, then there is a family on the next floor, then a (military) headquarters then another family. The people that live there are human shields…. This rush to Islamaphobia is a cheap trick and Greenwald and Co. are a bunch of carnies. After all that Greenwald has opined in the last few years no intelligent, informed individual should ever seriously consider anything he has to say. Greenwald was desperately hoping that the Boston bombers wouldn’t be Muslims so he could scream “I told you so”. Better luck next time Glenn. In fact, you’ve actually drawn even more attention to the fact they are Muslims. And that’s a good result in my book, because some of those still in denial will be forced to see the connection between Islam and terror. Harman, former Chair of the US House Intelligence Committee, didn’t blame “Muslim groups”, but merely speculated on the possibility that one fanatical Islamist group which very few Muslims actually support may be responsible. Exactly. It’s Greenwald, not Harman, who is introducing a general Muslim context here.